This problem has been popping up sporadically over the past number of months and I was unable to pin it to a particular client or server version. I’ve seen it in Vista and Windows 7 clients and also on MOSS 2007 with SP1 and with SP2. When opening a SharePoint library using the Windows Explorer, the user had to wait anything between 5 and 30 seconds for a reaction – opening documents caused the same delay. It was impossible to use effectively. I still haven’t worked out exactly how this setting is related, but changing it seems to have done the trick. Under “Internet Options”-“Connections”-“LAN settings” I disabled the checkbox “Automatically detect settings” (see below). Even though this was not effecting all users, I pushed this setting out in a GPO – so far so good. If your hard drives are too large to be managed by your controller (in my case 1.5TB HDD with an adaptec SATA RAID SA2420 card, with 1GB per HDD max.) you can resize them using using the Samsung EsTool available here. All details on the same page. To resize your disk use the SET MAX ADDRESS feature. After resizing, you will be able to use them with size limited controllers (of course you can restore the initial size if needed). In my case the SAN I have will shutdown immediatly if a power outage is detected : and this cannot be changed. You cannot delay this shutdown through the NaviSphere software. This is really annoying since the SAN hosts the Exchange databases (could have been SQL databases too). 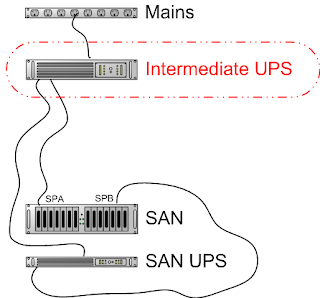 So my servers (connected to another UPS) can shutdown on a power outage (please read the shutdown scripts article) and then once the intermediate UPS battery is low (or you can parameter a delay too) it behaves like a power outage for the SAN+UPS and this one turns off too. When using the APC PowerChute software you can (must) run a script to shutdown your servers before battery is too low. 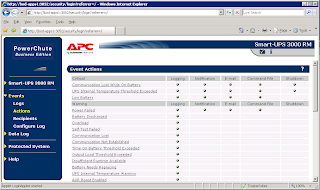 On the PowerChute web page, select the events you want to run a script from. Add the default.cmd (C:\Program Files\APC\PowerChute Business Edition\agent\cmdfiles\default.cmd) command file. rem Command Files run by PowerChute Business Edition must be placed in this directory. rem Use the full path name of executable programs and external command files. rem The @START command must be used to run executable programs (see example below). rem @START "" "c:\Program Files\APC\PowerChute Business Edition\agent\cmdfiles\myShut.exe"
This will shutdown your server remotely, closing all open applications and with a warning message. You can add other commands or batch too. IMPORTANT : the powerchute agent service may not run with sufficiant privilieges, so it cannot execute a shutdown on a remote server. Usually it uses a local account. This can happen even if the account has the necessary permissions to crawl the site. This error is caused by what is know as the “loopback check”. The loopback check is basically a security “feature” which won’t allow a local IIS website to be accessed using a FQDN. This prevents an attack from pretending to be local thus bypassing certain restrictions. Unfortunately, it also prevents your crawler from accessing local sites if they are using a FQDN. Add your NIS servers here (eg : nisserv1.mydomain.intra). It's recommended to add a secondary NIS server to your linux network, since if the only one breaks down, users with a NIS account (all of them in most cases) won't be able to log on the linux clients anymore. Only the user root which is local will be able. 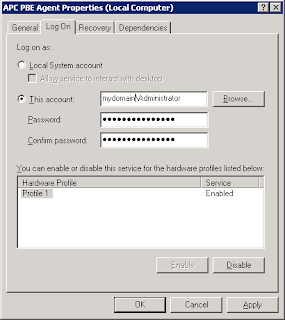 Install ypserv on the secondary server nisserv2.mydomain.intra, and make it start when booting. nisserv1.mydomain.intra has been set up as a NIS master server. Now you can run ypinit -s nisserv1.mydomain.intra on all slave server. 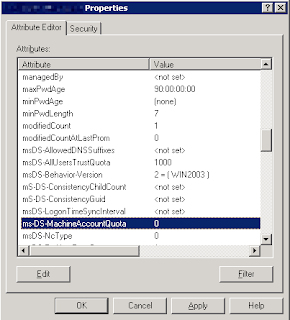 Now on the secondary server nisserv2, edit /etc/yp.conf and set nisserv2 as the NIS server to use. Client machines will use one of both servers. If the one they use fails, restart ypbind and by broadcast they will find one available.